Agility is a sport we do with our dogs. As with any sport, there will always be risks. Our dogs do this sport for us and it is OUR job to keep them safe! There is one organization that prides itself on being more difficult than others. Under this veil of pride, is an A-frame that is set higher than any other organization here or in Europe. Why is that? Why won’t they listen to their competitors who are begging them to lower the A-frame to conform with the other, more reasonable organizations? The dogs hit harder on the way up as well on the way down on the higher frame. I refuse to put my dogs on that high piece of equipment so they don’t get my entry. I am sure they don’t care what I think, but they should at least consider the dogs’ safety and the more important competitors’ opinions!!! Serpentines and wraps are extremely hard on fast large dogs! Serpentines cause dogs to load all of their weight on one rear leg to push off. That is a lot of force on a large, heavy dog! Wraps are horrible! Dogs are going all out, then asked to wrap tightly around a standard and come back in the direction from whence they came. This puts HUGE torque on the dog’s body and legs. The only thing worse is a wrap from the backside of a jump! The dog is completely stalled out and then has to hurl its body over the jump. Where is the common sense in this sport? But the BIGGEST safety issue in all of agility is the dog walk! I have seen so many horrific falls from the dog walk it makes me sick. WHY OH WHY is the dog walk four feet high? WHY OH WHY is the dog walk only a foot wide? WHY OH WHY do judges put HORRIBLE approaches to this VERY dangerous obstacle? This should NOT be considered a training issue. There are novice people who have no clue how to teach a dog to load onto the dog walk safely. There are handicapped people like me who can’t always get there to help their dog when judges put in a terrible approach to contacts. WE are the adults! WE ask our dogs to do agility. It is up to US to make sure that we keep our dogs safe! Our dogs do incredible things for us. We need to use our heads and not set them up for a fall or worse! Angled entries onto the dog walk need to be removed from agility! Even better, the dog walk should be lowered to three feet or LESS. It only needs to be high enough to put a tunnel underneath (but not for wraps up it!). The video below is sickening. Turn up the sound for the full effect. This little dog was never the same after this fall and ended up having to retire from agility. As if the height and width of the dog walk were not bad enough, some judges still design a wrap out of the tunnel up the dog walk! WHY IS THIS LEGAL??? ANYONE with an IQ higher than their belt size should know how dangerous that is! My first agility dog had to retire at SIX years old because of damage done to her back due to falls from the dog walk! I didn’t know how to help her. Even if you do know how to help a dog to get on straight, wraps out of a tunnel make it extremely difficult for a very fast dog to set themselves up for success. Even worse than a wrap out of the tunnel up the dog walk, is setting the tunnel exit to angle towards the dog walk up ramp rather than straight! WHO DOES THAT??? That sends the dog past the up ramp so they have to come back to load, making their approach to the dog walk even more crooked! That was the case recently. The result was a bad fall for our dog ending in a rear leg injury. Here is that fall in regular and slow motion. It could have been a lot worse had she been a large dog. The dog walk was very close to the wall shelf and had she fallen on that, she really could have been hurt badly, OR WORSE! As it was she hit the dog walk support leg (which should really be padded!). I BEG judges with all my heart to PLEASE stop putting in wraps out of tunnels up the DW!!! If the organizations are too stupid to figure out just how dangerous they are, then it is up to YOU to help keep our dogs safe! I have begged AKC to lower the dog walk but there is a vocal minority who want it to stay where it is. Evidently, International competition dog walk practice is more important than our dogs’ well-being. PLEASE stand up for our dogs! When others make fun of you for wanting the dog walk lowered or certain safety issues addressed, DON’T LISTEN TO THEM! THEY ARE WRONG! STAND UP FOR YOUR DOG! « Sir Cussalot Strikes AGAIN! This is a very late comment. Recently I drove the judge in our trial, who judges AKC, ASCA and CPE.to the airport for her flight home. We were talking generally about the trial and after a pause she remarked, “I wish that they would make the dog walk wider. It would be so much safer.” Why not add two inches, I thought? My dog runs agility well, moderately quickly. He has a slightly wide stance. On the dog walk, he crouches and and trots quickly, and I think it is because his feet are on each edge. thanks for posting this analysis – I have pulled a dog from runs also due to safety. That is why I play NADAC mostly. In NADAC we tried desperately to convince clubs to use a lowered dog walk and everyone blew up about “different” equipment and refused to do it. I wish all venues would lower the DW to at least 36″ if not 30″. There is no logical reason to keep it at 48″ other than the refusal to change. Come out and play NADAC with us – safety is always first. DW is same height but approaches never look like what you show here. Aframe is lower, dogs can jump lower (big dogs down to 12″ after 7). Fast flowing courses! I’m shocked at the personal attacks in some of these responses. Isn’t it possible to disagree and still be respectful of others opinions? I’m not sure I understand why the dog walk needs to be as high as it is. I have no issue with training my dogs, but we all have bad days and I would hate to have my dog’s bad day or misstep cause a serious injury simply because of the height of the DW if there is no purpose for it. If the DW is 2′ off the ground, the BC would still have to jump off in the middle due to his approach to the upside ramp from the tunnel. The legs of the DW would have to be modified in this scenario because the legs would be further out, creating a tripping hazard for both dogs + handlers. The papillon still would’ve fallen off as well – and who knows what body part the dog would’ve landed on – still could have been on it’s poor neck! IF YOU try to run faster than you are really able to, bet you trip and fall too. did every other dog fault this obstacle? If this dog hadn’t fallen, would you still be writing this blog? Helen, you don’t think the handler in the second video could have done anything different to prevent this fall? We can’t hear when he told the dog to turn out of the tunnel to get on the DW. We don’t know how this dog was trained as far as getting on the DW straight or how to control his body before getting on the DW. The handler was so far ahead of the dog as well – Looked lovely, but help a dog out once in awhile! The handler looked *extremely* confident in his dog’s abilities, but this dog looks to need more help with this maneuver. I can see the dog’s path out of the tunnel and the path as he approaches the DW. He went wider out, past the DW approach (more to the left side of the DW as he headed towards the DW). Then he curved back to get on the DW, which made him lean more towards the right on the upside of the DW, where he finally couldn’t hold on anymore and jumped off the right side. Just based on the dog’s path I would say the dog wasn’t clear that he should turn *tight* out of the tunnel. He was quite wide. Which caused the fall. And it doesn’t matter how large the dog is – a wide turn out of a tunnel then up a DW will definitely increase the odds of falling off. And of course a faster dog will be more likely to fall as well if approaching the DW at an angle. I am one that will TRAIN my dog to be safe – I will not blame anyone else but myself if something happens to my dog. If I think something is unsafe, I will not run it. Sorry, but the handler and trainer of this BC caused this fall, not the judge or course design. So far between comments here and Facebook as well as the many private emails and messages I have received it is about 99% in favor of my blog and 1% against. I would hope the people who are subscribers to your blog and friends of yours on Facebook would agree with you! Doesn’t mean a thing in the grand scheme of things tho. Well said, Sue. Always seems like it’s easier to blame the organization or the judge than the lack of good handling. What amazes me is that people who want to blame the organization or judge and are demanding of “safer” approaches to obstacles are thee same people that….OMG just watch what happens during FAST or Gamblers etc. The approaches that handlers ask their dogs to do to obstacles, a judge would never put on their courses. Train don’t complain. There are many courses that I run that aren’t meant for me and my dog, does that make them bad or dangerous. Just means I haven’t trained my dog well enough to do them. No one is forcing you to run your dog in agility. If you feel that obstacles in agility are not safe, maybe you should stop running your dogs in it. It is not reasonable to demand changes to a sport to fit your specifications. There are literally millions of agility runs made every year in the US. Will some of them result in injury? Undoubtedly. Agility is a sport with risks, on all obstacles. I have seen or heard of injuries on EVERY obstacle, including jumps – knocking the first bar and stepping on it caused torn ligaments in a dog’s wrist. Does that mean we should eliminate jumps? A dog misjudged the table and hit it with his shoulder, causing lameness. Should we eliminate the table? Wraps from a tunnel to a dog walk are not inherently dangerous. The video you show has the dog traveling at least 8 feet out from the tunnel before turning around and approaching the dog walk STRAIGHT. How is a straight approach to the dog walk dangerous? The dog misstepped on the up ramp after getting on but that has nothing to do with the tunnel before that. The courses we have here in the US have, on average, much straighter approaches to obstacles than the courses in Europe have. Yet the handling done in Europe creates a very smooth and efficient (and, dare I say, SAFE) path for the dogs. Wraps and backsides and etc. are all training issues. They are not inherently unsafe. I have big dogs and they are able to negotiate all of these sequences well – because I spent the time to train them well. And I for one am happy that challenges like this are available in US courses, because straightforward, no-challenge courses are, frankly, boring to run. Bottom line: agility has risks. If you are not happy taking those risks, don’t run. Don’t expect the sport to conform to your desires. I am VERY concerned with my dog’s safety. That’s why I spend so much time TRAINING them to be able to execute almost any sequences and I HANDLE them to optimize their safe execution of those sequences. Tunnel to dog walk turns are NOT inherently unsafe. They need to be handled appropriately. Same with backside jumps, wraps, serpentines, and on and on. Handling is what makes sequences safe. You are ranting in your blog about sequences being unsafe. Make them safe for your dog! Equipment issues are a different thing than what you are talking about in your blog post. Yes, there are changes that needed to be made to equipment, and there are more that need to be made as well. That is a different issue. What is sad is blaming the course design rather than training and handling appropriately. And implying that course designers have ..an IQ lower than their belt size is NOT mean?!! What is happening here is bordering on poor sportsmanship – your concern for your dogs’ safety is apparant, no one is denying that. But implying that anyone not in agreement with you has no concern for their own dogs is slanderous. But here’s the thing – changing the way courses are designed is NOT the only way to do that. WE need to ensure are dogs stay safe so WE need to learn how to handle them so they can. Support those wraps from the tunnel to the dog walk so they get their footing correctly. Shape entrances to obstacles rather than trying to get them to fling themselves over as fast as possible, in search of the almighty half-second of course time. It is up to US as handlers to help our dogs negotiate the courses safely. There are actually very, very few unsafe courses out there in the US. Our handling (or more specifically, lack of it) is what make them unsafe. So now this is about your emotions? I just didn’t like that the judge had to throw his hips around the teeter to clear it to then race the dog to the other end. But I bet there’s a minimum separation distance. Great post. My baby dog took a fall from a tunnel wrap to a dogwalk and it gave me a heart attack and he got what looked like a burn up his front leg. Yikes! I am going to have to be more conscious of it in the future. Maybe, just maybe …the judges should open their eyes , if we are realistic this is a Sport and in all sports accidents happen , its something really difficult to control . what we can do is minimize this accidents , judges are making incredible options regarding entrances of contacts . When i see something like this last video i wonder how many people is this competition complain with the judge ? I wonder if people will invite this judge again ? Thankfully in Australia it is only legal to do contact obstacle to tunnel direction, not the tunnel-to-contact obstacle. Safety first. If you believe that the wrap to the dogwalk is so dangerous, why not stay with your dog and work it? In many cases, our own handling makes a course even more dangerous. Sometimes I think that the timer is the most dangerous piece of equipment and people work for faster and faster times, wrapping tighter, and pushing the dog beyond their safety. So all courses should be designed to accommodate your handicap? I don’t understand how your handicap would affect this. Stay with your dog as they get on, then train them to wait (2on2off) until you catch up. I trial with a man in a wheelchair with a very fast dog. He depends on that dog waiting for his command. I assume we are talking about AKC, and AKC does allow you to drop your dog (as long as it isn’t in the last third) as part of your handling. I’m not handicapped, yet I will still drop my border collie once in a while to get her lined up with something. Of course, it would mean I wouldn’t take home that blue ribbon…. Why was the handler so far ahead blind crossing. No benefit to being past the jump when the dog was in the middle of DW. I BLAME THE EXHIBITOR FOR THE DOG FALLING. And just because you have a blog doesn’t mean everyone will agree with you and certainly doesn’t mean you are right. And who said “dat’s why I hate doze things” on the recording? I am in full agreement with you Helen!! 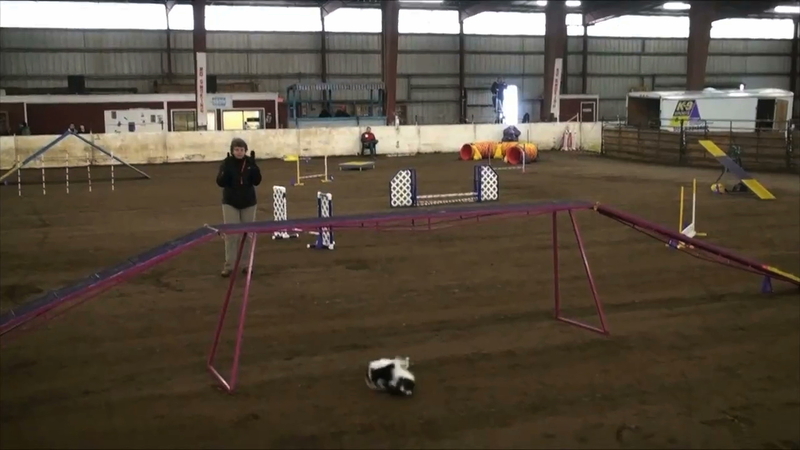 In TDAA – I host these events with dogs that are 20″ at the withers and under and all the contact obstacles are the same width as AKC and ASCA however we drop all of them to lowered heights. I know some people will say that is fine for little dogs but not for the bigger dogs…on the contrary; dropping the heights to 3′ on the dog walk and 5′ on the Aframe and 20″ on the teeter has made a HUGE difference in my dogs contact performance! They are stronger, more confident and much faster with the lowered heights; not to mention must safer!!! I see NO reason that these obstacles need to be as high as they are – does not make any sense what so ever….I have had a dog dislocate – relocate a shoulder falling off of the dog walk. I have had students have many injuries based on dog walk falls not to mention those people that have had to retrain for months on end after a fall. This needs to change and someone needs to start listening to those of us that have been complaining about the heights for years!!! and the Aframe is lowered for small dogs–why not the DW & teeter? Let’s not forget the tire — of all the jumping obstacles, this is the most dangerous, yet the 3 big agility organizations all have different specs for it. AKC and CPE have bigger openings, yet set the height differently. USDAA has the smaller opening and sets the height like CPE. Why oh Why indeed. Drives me nuts!! Until it is THIER dog injured….people do not care!!!!!! There are committee to address issues with companion and performance events, at the AKC Delegate meetings. You can share your concerns with these committees. I have shared my concerns with the committee a few times! I know others who have as well. No changes. I’ll bring it up at the next meeting. Why do the walks have to be so high, stupid really. Is there ever a time when you say “no” I’m not doing that with my dog; if you feel it to be dangerous? Yes Sherry, I have pulled from runs because I felt there was a safety issue or because it was too hot (I have done that a few times even with a double Q on the line). I wish they would lower the DW. It makes no sense to me. It would be more difficult if the dog could step off at anytime but knew not to vs. staying on because it is so high.